Also known as the Northern White Pine, this pine tree is a fast growing, sturdy, and majestic tree that can live up to 200 years. It is in the Pinus (pine) family which has about 100 species worldwide. Pines are divided into three subgenera relative to the number of needles emanating from a common basal sheath; two-needled, three-needled, and five-needled pines. 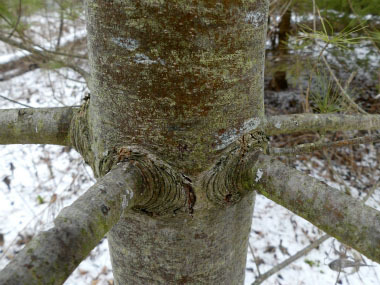 Historically this tree is known for many uses including ship masts; today, it is used in construction and in carpentry. The bark has a strong resistance to fire. Trunk/bark: Trunks are tall, straight and can reach diametres of up to one metre (3'). 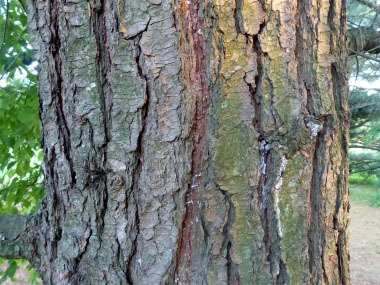 Young bark is thin, greyish-green, and smooth. Mature (outer) bark is 2 to 5 cm (1 to 2”) thick with broad ridges of dark-tinged scales. Branches/twigs: Branches are stout, irregular in shape, and grow horizontal to ascending. Twigs are flexible, green and in the first year, hairy. 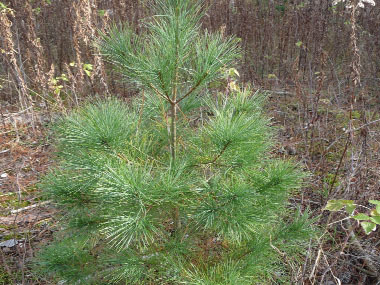 Height: The eastern white pine can grow to be more than 40 metres tall. Leaves: Being a conifer, the pine has needles, not leaves. The needles are light, bluish-green, soft, straight and slender. Needles measure anywhere from 5 to 15 cm (2 to 6”) long, are three-sided, finely toothed, and occur in bundles of 5. They will drop anywhere from one to four years depending on conditions. Fruit: Male and female cones grow on the same tree. Male cones are yellow, small, and clustered at the base of the current year's growth. Female cones are what stands out. The eastern white pine female cones measure 8 to 20 cm (3 to 8”) long and they hang downward from the branches. Typically a tree is 20 or 30 years old before it reproduces, and then only every 3 to 5 years. The female cone matures in two to three years and drop soon after shedding the seeds. Habitat: White pine trees can be found anywhere from dry rocky ridges to sphagnum bogs. It tends to prefer cool, humid areas with well-drained soils. 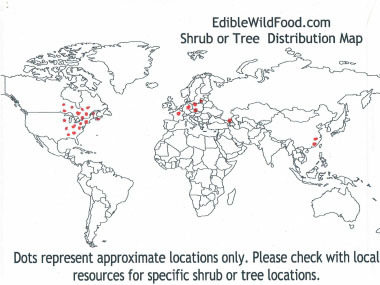 This tree is found anywhere from the central to eastern parts of Canada and the U.S., as well as in parts of Europe. In Europe, this tree is better known as the Weymouth. Edible parts: Pine needles can be dried and ground into smaller parts for tea. They can be ground down to use in baking or cooking. Although the inner and outer park can be used as a food source this is only in a survival situation. 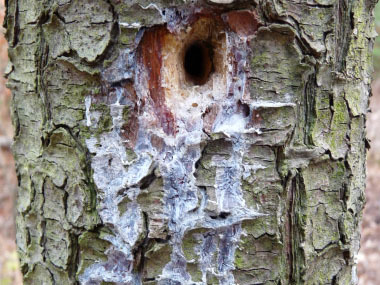 Pine sap can be used as a source of nutrients as well. Pine needles contain a wealth of nutrients. For more in-depth information (e.g. nutrition, medicinal values, recipes, historical information, harvesting tips, etc.) 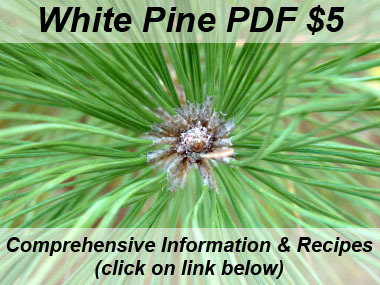 please check out our White Pine PDF magazine.